The road to an apprentice falconry license is a long and winding one. There are things to do, places to go, people to see. To some, it seems like an impossible barrier. To others (like most of the folks in our organization) it is just a walk in the park. So if you are serious about doing falconry, and you've come this far, here are my "Tips for the Apprentice". First: join the Texas Hawking Association and support your state club. I invite all who are interested to join, whether serious about doing falconry or just mildly interested. The THA is the only reason falconry is legal in Texas. 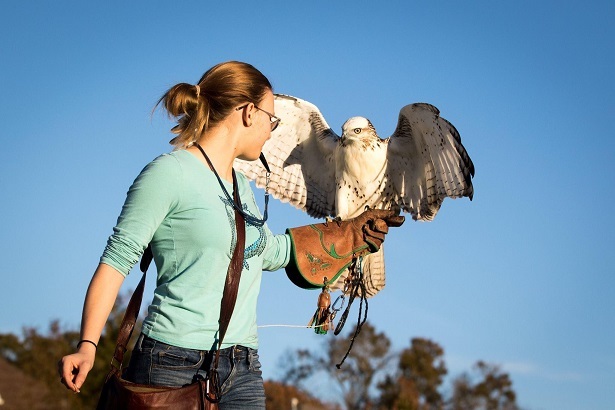 The THA has worked hard over the years with the Texas Parks and Wildlife Department to negotiate some of the best falconry regulations in the country. In addition, we publish the "On The Wing," a quarterly magazine. We have an annual Summer Picnic and an annual Winter Field Meet, plus a couple business meetings scattered through the year. A great place to meet the officers and the membership of our club and maybe even a prospective sponsor. Our winter meet, usually held in Abilene during January, is a premier state falconry meet. It attracts falconers from all over the country who enjoy flying their birds on our abundant small game and waterfowl. And it is a great place for newcomers to meet, talk, and hunt with falconers of all skill levels. Second: Read 'North American Falconry and Hunting Hawks' by Hal Webster and Frank Beebe. Read this book BEFORE embarking on a quest to find a sponsor. It will answer most of the basic questions you will have, and it will show the person you hope to apprentice under, that you are serious about not wasting their time. An apprenticeship is a two year commitment at a minimum. You want to be a good student. You also want to get familiar with falconry laws both federal and state. The THA has links to both the state and federal falconry regulations. Again, they will answer most of your basic questions. Third: Be patient, grasshopper! Take your time. You've waited your whole life to be a falconer, what is another season? The THA publishes a membership list in all of our newsletters. If approached politely, most falconers don't mind showing interested persons' their birds and facilities. Find out who your falconry neighbors are. Find someone who lives close and get involved. Spend a season watching how they handle their birds. How they manage them. Spend some time flushing game for them. If approached in this manner, most falconers will be sponsoring you without you even asking. Please do not call a falconer you have never met and ask them to sponsor you over the phone. This hardly ever works. Trust me. There is no short cut. Finding a sponsor is about taking the time to learn about how someone else practices the sport. Fourth: When it is all over and you have your first bird, hunt it everyday you can during the season. That's what falconry is all about.